What's your favorite color, Tim? The year was 1984, and Tim Stoddard was a man on the move. After helping the Orioles win cheering from the bullpen as the Orioles won the 1983 World Series, Stoddard was twice traded first to the A's and then to the Chicago Cubs. Rather than being upset about his career upheaval, Stoddard got excited maybe a little too excited. 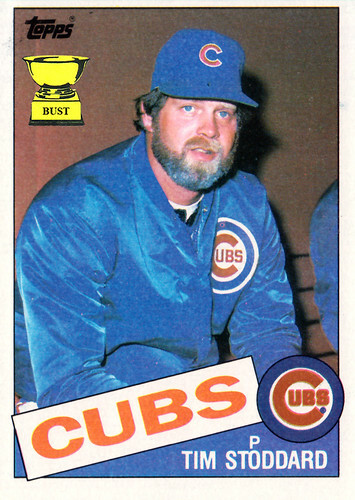 To show his enthusiasm about being a Cub, Stoddard decided everything about him needed to be blue. He dyed his beard blue, as seen above. He repeatedly tried to wear jeans on the pitching mound. He painted his fingernails. Cubs manager Jim Frey put up with Stoddard's antics that is, until Frey walked in on Stoddard pulling a Jason Biggs prequel with a warm blueberry pie in the locker room (purely for cosmetic purposes, of course). Stoddard joined the San Diego Padres in 1985. There's nothing like warm blueberry pie.